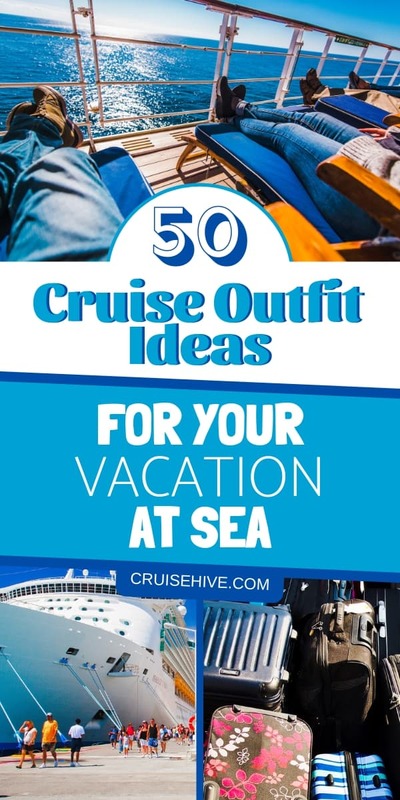 For some, the most exciting part leading up to a cruise is planning what you are going to wear while you are on vacation. You know you are going to be having the time of your life and feeling great, so why not plan your wardrobe so you look fabulous as well. Disclaimer: This post includes affiliate links which we could earn a commission from. As well as making sure you look on form when you are on your cruise, by following a list and planning ahead you are less likely to forget any items of clothing behind. Sometimes you just have to get in that vacation spirit buy having matching outfits for the entire family. This set is very vibrant and can be worn not just around the cruise ship but in port too. Take a closer look here. This floral summer dress is everything you need to look the part on deck at sea. It is comfortable and lightweight, and the boho design is easy to wear for many different body types. Fashionable color blocking shirts are perfect when away. They are casual but still stylish enough to help you look great. They can be paired with jeans and sandals for a relaxed look. Check the details here. Harem pants are all the rage at the moment and they are an ideal item to take along with you for your vacation at sea. They are incredibly comfortable to wear, but they create a relaxed yet elegant looking outfit. The bow tie front adds that extra bit of style to the pants. The comfortable and stretchy fabric make this dress ideal for spending time out on the deck. Paired with a necklace and some earrings and the dress can be taken from the deck to the bar easily. Have a look right here. A nice cruise inspired outfit which is a woman’s jumpsuit featuring a striped cotton design, Perfect for around the deck or even in port. You never know when the rain might hit out at sea, but you always want to look your best as well. This hoody dress will give you that casual summer look, but it has the hood ready and waiting for those sudden downpours. Cargo shorts are a must have. They will be comfortable for regular use on the cruise and the different pockets are essential for carrying around all your items such as cards, keys and cameras when out on the deck. Baseball shirts are a classic wardrobe item. They are casual and comfortable, and come in many different colors. Having a few of these on vacation with you will give you many different outfit options to choose from each day. Most cruise ships have gyms onboard. Be prepared to keep up with your work-out schedule with these loose-fit performance shorts. They are lightweight, quick drying and moisture-wicking. There’s nothing better than walking around the ship on a nice sunny sea day in matching outfits! A nice Hawaiian inspired style which is perfect for a Caribbean cruise. Take a look here. You will need a bikini to show off your summer figure when sitting at the pool on a cruise. This strapless bikini is padded and has a lace up design at the back. The high-waisted pants are in fashion at the moment, giving your body a beautiful shape. More about this item can be found here. The tie knot bikini is a classic look. It is made with a soft and elastic 100% polyester material. It comes in a variety of colors, perfect to suit your style and wardrobe. A little push-up bikini with a cute tropical print will be your favorite pool-side wear on your cruise. Nothing will get you into your cruise vacation mood more than a bit of a tropical print. The wrap around bikini top adds some extra flare to the piece as well. If you prefer a more conservative look or want to cover up more of your skin from the sun, this monokini is a great choice. It comes in a variety of colors and gives great support to your figure with the push-up structure. Throw on this light and airy kaftan cover up when you are done in the pool and want some extra protection from the sun. It keeps in tone with the holiday look and the tassels create a more styled look. This cute little black number will be an ideal cover up next to the pool. It will transition fashionably from swims in the pool to cocktail hour at the bar on the deck. Check all the details here. This lace bodysuit is great to throw on once you are done splashing around the pool area. It covers up your swimwear, but still gives you that summer goddess look. It is light and airy which makes it perfect to wear in the summer heat. A knee length pair of swimming trunks are a must in any man’s wardrobe. This pair offers a UPF 50+ protection, helping keep your skin safe from the sun. The triple stitched sides make them durable and sturdy for regular use. The sailing styled stripped design seems to be in fashion. Here is a nice cover up when you’re spending time at the beach during a port of call. Every man needs a pair of brightly colored flamingo trunks. These blue and pink colored swimming pants will help you stick out among the crowd. They have that holiday feel that you will need to sit back and enjoy the sun. A little black dress is a must for every female. This off-the-shoulder dress has a zipper closure for easy wear and it the perfect mix of sophistication and fun for a fancy night out. If you are planning a fancy night out on the cruise, this little number will wow your date. Purple is such a fun color, and the design of the dress is whimsical and will make you feel like royalty. Click here for details. A pashmina scarf can fancy-up any dull outfit. It will be the perfect accessory for an elegant night out, and it will bring a pop of color to an ordinary outfit. If you want to go all out with your evening wear, this is the dress for you. It is a showstopper in white and you will both look and feel like a celebrity the moment you step into the dining hall. A shawl is a timeless piece that can be worn with any evening wear dress or ensemble. It is perfect to use when spending time outdoors in a cool breeze, and is a stylish alternative to a jacket or sweater. Have look here. A slim fit dress shirt always completes a formal outfit perfectly. It shapes the body to perfection and is sophisticated and elegant on a night out. A good tie can turn an outfit from drab to dapper in an instant. The right color skinny fit tie will complete your outfit and make you look as elegant as can be. If you want to avoid looking too formal on your night out, this button down palm tree shirt is a great alternative. It is casual enough to make you feel comfortable, but still gives off a bit of a formal look. The palm trees are a fun added extra to match your holiday feel. This sweatshirt will keep you looking smart and polished when out at a formal dinner on the cruise. It will keep you warm if there is a bit of a breeze, but it will in no way look too casual. Polo shirts are a classic item that can transition from day time wear to smart night wear easily. They are smart enough to be worn to a fancy dinner, but can still be worn casually during the daytime. Check this one out. The zip down puffer vest is vital for when the weather cools down. It can be worn over normal clothing and adds that extra bit of warmth you need. Not only will a slouchy knit cardigan keep you warm, but it looks really pretty as well. Paired with skinny jeans and boots, you will have the perfect outfit. These velvet lined leggings will be your best friend when cold weather hits. Pair them with a jersey or long sleeve shirt and you will be set to go. Leg warmers are a great option to be worn with shorts, a dress or a skirt when there is a chill in the air. They come in plain colors or you can choose a funky design to make your outfit pop. Keep your head and ears warm with a cute oversize cable knit beanie. It is a great winter accessory to any outfit. When you can’t keep the chills out, these thermal socks will be the answer. They lock in the heat and fit inside any ordinary boot or shoe. This slouchy beanie wool hat will keep you warm and help keep the chills away when outdoors in a cool breeze. A good quality cargo work jacket will last you a lifetime. It is an essential item to keep and can be worn in any occasion. The can be dressed up or down to suit your needs. Keep up your workout routine, even when the weather turns sour with these active winter pants. They provide warmth but are also breathable with an elasticated waistband. These sport cargo pants can be dressed up for day time or night time, all while keeping you warm and looking fit for the part. Add a bit of extra fun to your holiday with this Cruise Control cotton pajama set. Your vacation finally gives you a reason to pack and show off your cruise addiction! A lightweight and soft sleepwear set will be your best option for those warm summer nights during the cruise. The racerback top and matching shorts are comfortable for sleep. Always have a warm pajama set on hand in case the weather turns south. This fleece set will keep you warm while still being cosy for a good night’s sleep. An oversized sleep shirt is easy to throw on after a long day on vacation. Comfortable with no fuss. The faux fur slipper will add that bit of cuteness to your pajama outfit, and they are comfortable enough to give your feet a break after a long day vacationing. Even men need to be prepared for the colder weather that could hit during vacation. The thermal Henley top and fleece pants will keep you as warm as can be, letting you get a solid night’s sleep. A soft cotton summer pajama set will be perfect for your cruise vacation. It will keep you cool during the summer nights and the material is breathable and lightweight. Your feet also deserve a bit of comfort. They will be sore and tired from all the activities on the cruise all day, so give them a break at night with these super comfy memory foam slippers with anti-slip soles. Make sure you get the best night sleep that you can. The sleep mask will cut out all light, letting you quickly slip into sweet slumber, resting up for the next busy day. Time to Get Packing Then! Be fully prepared and looking great when on your vacation out at sea. Use this list to help you pack for your trip, and make sure not to leave anything behind! Feel free to check our dedicated section for more packing tips. More than 50 items on what to pack for a Caribbean cruise vacation. Items which can enhance your cruise experience along with packing tips.